We went to two makan-makan events last week but I came home starving. One thing that I learnt was never expect to eat a lot when you brought along your 5 months old baby. My parents-in-law organized a makan-makan event at their house because my mother-in-law was going for Umrah. I could have ate a lot there because Sofia seemed fine; a lot of familiar faces, but then I was saving my perut for the other event. The other event was a wedding reception held at a restaurant, Satay Station at Ampang Waterfront. Honestly, I actually expected the area to be a bit like Kinta Riverfront with nice decorations and all but oh well... Tak apalah. Hahaha. Mak long seemed almost fed up. Haha. Okay not really 'haha' because I was feeling a bit fed up too. Feeling fed up, I joined Iz and Sofia (in the carrier) at one corner. I decided to just let them eat while we wait here. Oh but then finally we got one good place. Very near the stage but not too near a boom box. And guess what? Zamani sat there too! Seriously, when I heard him singing I was like wah sedapnya suara dia live. Mum ushered me to take a picture of him singing but I wanted to just act cool (besides, I should be focusing on this baby)... Then suddenly he sat right in front of me! Yes I was starstruck. But then Sofia got uncomfortable because it was too crowded and fuzzy. Mum had to take her to the kitchen where it was air-conditioned. I went to check her out and got worried because I didn't bring along her milk. Thinking she might want to latch, I stayed close to her. We then went outside, thinking she might need some fresh air. I decided to just stay with Sofia there with a plate of satay I brought along. See? Love is ditching your VIP seat to sit outside next to a garbage disposal. Bye Zamani... Mum went inside to change shifts with Iz. Orang kata kalau jodoh tak ke mana... Suddenly Zamani came outside to get some fresh air. And yes, we took a picture with him just at the garbage disposal area. 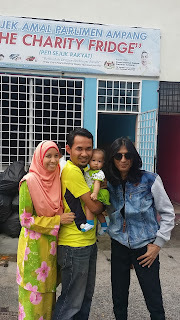 And both her mama and papa kept on singing Zamani's songs all the way back. Including Sofia... She kept on singing in the car (coo-ing panjang so I guess tengah nyanyi la tu). We met him on Saturday. Today is Wednesday already, I still had his songs ringing in my head. While Sofia? Biasa je. Dah tak menyanyi dah. She had no idea the guy that hold her hand (yes Zamani pegang tangan Sofia! Dah lupa dah peraturan basuh tangan dulu sebelum pegang my baby...) is a freaking artist. Tapi seriously memang sedap suara dia nyanyi live. lama gile tak pergi satay station. was in love with their satay and mee rebus but then, biasa la.. deteriorate sikit rasa dia, tapi harga tak. now dah jumpa other places with cheaper satay and mee rebus but way better. Oh nanti share la mana mi rebus sedap. Bash dengar orang cakap satay dia sedap tapi itula haritu pun tak dapat nak makan sangat pun..
Hahaha! Gerimis mengundang memang lagu famous dia pun.